An EU Forest Law Enforcement, Governance and Trade (FLEGT) working committee has been established in Karen State. 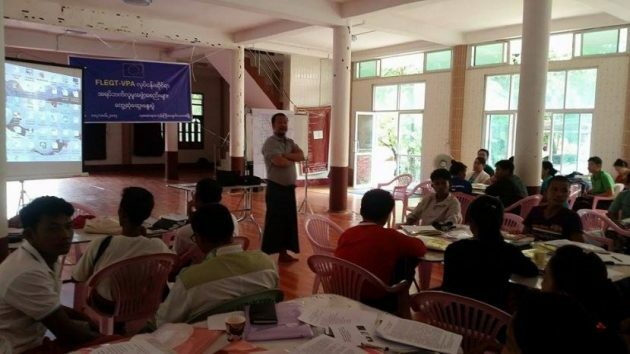 This came after a FLEGT Voluntary Partnership Agreement meeting with various civil society organizations (CSOs) in the state’s capital Hpa-an on June 17 and 18. CSO representative from the interim working committee Ko Zaw Thura said that “the aim is to now [raise awareness] on how local residents can live in harmony with the forests, deciding how to make profit without [severely] affecting these forests and implementing a forestry management system that can last forever”. A three-party coalition comprising of government representatives, private representatives and CSO representatives will be established at the township, state and union level to carry out the works. The state’s working committee hopes to raise public awareness of the forestry law, carry out forestry protection tasks, assist the public in solving issues relating to the forest and cooperate with government departments and business owners. But there is a long way to go before curbing deforestation in Karen State. Ko Zaw Thura said that most of the heavily forested areas are under control of ethnic armed organizations (EAOs). Representative of Sar Mu Htaw Karen Social Organization Saw Ka Lu Htaw told KIC News that Thandaung and Leiktho areas are facing deforestation because the government granted licenses to EAOs after they signed the ceasefire. “At first, there were many teak trees. They cut them down and sold them,” Saw Ka Lu Htaw said. Saw Ka Lu Htaw said the groups then moved on to smaller and smaller trees until “now, all the trees and bamboo are gone. We only have bushes left”.